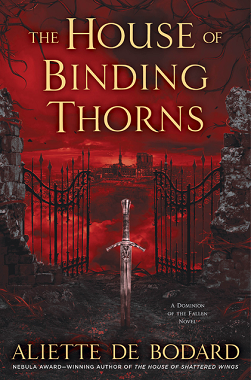 The House of Binding Thorns by Nebula Award–winning author Aliette de Bodard is the second novel in the Dominion of the Fallen series, a dark Gothic fantasy set in the ruins of an alternate Paris containing fallen angels, magic, and a dragon kingdom under the Seine. Though it follows events in the previous novel set in this world, BSFA Award winner The House of Shattered Wings, it’s considered a standalone sequel: it shifts the focus from House Silverspires to House Hawthorn and the dragon kingdom, and while it follows a couple of the same characters as the first novel, it also introduces some new ones. It’s certainly not absolutely necessary to read The House of Shattered Wings first (and, personally, I much prefer the newer book), but it would probably be helpful to do so since this novel does continue the stories of some of the same characters. After the head of Silverspires learned of their House alchemist’s angel essence addiction, she dismissed Madeleine from their protection. Madeleine was then reclaimed by Asmodeus of Hawthorn, who has haunted her nightmares ever since she crawled away from this House twenty years ago—the night of the violent coup that ended with Asmodeus’ ascension to the head of House Hawthorn, many deaths, and her own severe injuries that never completely healed. Once Madeleine has been weaned off the drug, Asmodeus presents her with a choice that is not much of a choice: she must pledge her loyalty to him and avoid relapsing in order to serve the House, or he’ll “release her.” Shortly after obtaining her oath of fealty, Asmodeus informs her that he intends for her to accompany a Seine-bound delegation that will be negotiating a formal alliance between Hawthorn and the dragon kingdom through Asmodeus’ betrothal to a dragon prince. All is not well in the dragon kingdom, and the diplomats find the dragons appear sick and frightened, there seem to be divisions among them, and the envoy Hawthorn sent to pave the delegation’s way has not been seen in three days—and no one knows what happened to her. The cause of the dragon kingdom’s vulnerability is a recent influx of angel essence that has left many of its inhabitants skeletal with easily broken antlers. Considering that Hawthorn is the closest House to the Seine and the one that would benefit the most from their weakness, the dragons believed them to be a possible culprit and sent one of their own, Thuan, to infiltrate the House. For the last six months, Thuan has been acting the part of a young Annamite mortal seeking to become a dependent of the House, but in fact he has been trying to uncover the source of the angel essence destroying his kingdom—before it’s too late. Despite its power, Hawthorn has enemies of its own, and both the House and the dragon kingdom may need to work together to survive—or they may fall together. Though it featured an intriguing world and some lovely prose, I felt The House of Shattered Wings was hindered by too much narrative introspection that didn’t add to the story or advance the characterization, making parts of it rather dull (my review). In the end, it had enough strengths that I ended up deciding to give The House of Binding Thorns a chance, especially after learning it focused on House Hawthorn and Asmodeus, who was one of the more compelling characters from the previous book—and I’m happy I did since it’s a far superior novel. While I still felt each of them could have been fleshed out with more distinct narrative voices, I did find both Madeleine and Philippe’s stories and characters were more engaging than in the previous book. Madeleine’s struggles as an addict and a traumatized victim of Hawthorn’s coup are sympathetic and heartfelt, and though she wasn’t my favorite character, I enjoyed her story since the dragon kingdom was mostly viewed through her eyes. By far, my favorite point of view character was Thuan—his secret identity added some tension since there’s always the possibility of his discovery, and though dutiful to his kingdom, he also grapples a little with guilt over lying to those within the House who have treated him kindly (plus I love dragons!). However, I thought Francoise was the most fascinating and well-drawn character even if I preferred following some of the others’ stories. Out of the four main characters, Francoise is probably the most “ordinary” and least powerful. She’s not a dragon or magician (though Berith can temporarily lend her some of her magic) nor does she have the power that comes from being part of a House, which makes the way she approaches challenges all the more admirable. She bravely faces Asmodeus, a Fallen feared by even Philippe and Thuan, on more than one occasion, and is a pillar of inner strength and resilience—and, unusually for fantasy, she does it all while pregnant or recovering from a difficult birth. In general, The House of Binding Thorns is a unique addition to the speculative fiction genre. Though themes of community and belonging are not uncommon in stories, these are deftly and thoughtfully handled here, and it also examines post-colonialism with inspiration from France’s interference in Vietnam and the Opium Wars. Like many fantasy novels, it has an emphasis on power and those who wield it, but I found its approach to power struggles refreshing. Various characters and factions are grasping for dominance, but many of them do not seem to be doing so out of greed or a desire to become powerful, but mainly for survival—not only their own, but that of those they care about or their community as a whole. Despite a plethora of powerful characters with dragons, magicians, and Fallen, there is some balance and no one is so secure that they do not fear anyone else. As mentioned, Asmodeus instills terror in even dragons and former Immortals due to his notorious ruthlessness and, though not a point of view character, he’s a fascinating character who tends to steal the show. He’s still somewhat mysterious since we only see him through the eyes of others, but it is shown that he does have a moral code of sorts since he tends to keep his word and look out for Hawthorn’s dependents—and there are even a couple of times some vulnerability shines through the mask he presents to the world. The House of Binding Thorns further develops the world of the Dominion of the Fallen and is much stronger and more memorable than the previously published novel. It’s more engaging and better paced with gorgeous, atmospheric writing that fits the story and setting (of course, more focus on the dragon kingdom is quite welcome too!). Though more compelling than in The House of Shattered Wings, the characters did not seem as distinct or “alive” as I would have liked, but other than that, I thought The House of Binding Thorns was a standout novel.